The mother of the young boy who was publicly flogged by Ghanaian pastor Bishop Daniel Obinim says she will invoke curses on those calling for the pastors arrest while the mother of the girl said the beating wasn't enough. A Human Rights Lawyer Francis Xavier Sosu and two others have filed suits against Bishop Obinim after several calls from lawyers and human rights activists for his arrest. In an exclusive interview on Joy News Friday, Madam Akua Bempomaa said the action of the controversial Bishop was a step in the right direction. 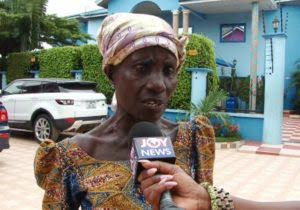 "If Ghanaians do not stop condemning the pastor for correcting the children I will begin to invoke curses on them, the 72-year-old woman threatened. In a video which has gone viral on social media, the Founder and leader of International God's Way Church, who refers to himself a Angel Obinim, is seen whipping a teenage girl and her boyfriend with a belt allegedly for fornicating and attempted abortion. Madam Akua Bempomaa said she was very excited to watch ‘Angel Obinim discipline her son. "He is our father, he has been taking care of me and my son since my husband died. He is the one paying my sons school fees and has the right to discipline him when he goes wrong,"
She called on all who are condemning the pastor for ‘putting the children in their right place to rather commend him. "When my husband died and we needed help, no Ghanaian intervened, not even my family. Angel Obinim took u in and enrolled my son in school so they should leave the ‘angel alone." On her part, the girls mother, who is also a member of the church feels the belting was not enough. "Papa should have beaten her more. Imagine what would have happened if the prophecy had not come and she drunk the medicine to abort the baby, she added. Meanwhile, the Minister for Gender, Children and Social Protection, Nana Oye Lithur indicated in a Facebook post that her outfit has reported the matter to the Tema Regional Police. Justifying his action in another interview on Multi TVs AM Show on Friday, the controversial man of God said he did it to instill discipline in the teenagers, adding said his father Jesus Christ revealed to him while he was prophesying that the two teens were planning to terminate the pregnancy.